50 Cent launches SYNC by 50 headphones – and disses Beats by Dre | What Hi-Fi? 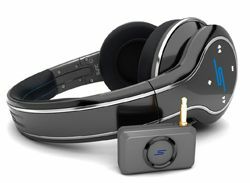 50 Cent took a swing at the Beats by Dr. Dre range of headphones as he launched his new SYNC by 50 wireless headphones. No stranger to 'beef', the hip-hop stars are now set to do battle in the lucrative headphone market. Launching the SYNC by 50 headphones under the SMS Audio brand, 50 Cent said Beats by Dre headphones "break too easily & sound bass heavy". His headphones, he revealed, had been benchmarked against Bose and Sennheiser rivals – not a bad start. The end product is the SYNC by 50 headphones, which use Kleer wireless Bluetooth technology. The headphones also promise noise isolation, built-in remote controls, a bass boost option – a nod to Beats by Dre?! – and improved protection from external interference. The SYNC by 50 headphones claim a 15-18 hour battery life and will go on sale for £299 when they launch on May 1st. 50 Cent, speaking at the press launch, also promised more SMS Audio products to follow after the launch of the headphones. Get more information on the SYNC by 50 headphones range on the SMS Audio website.